How to grab a prime on-shelf position in one of Germany’s leading drugstores. First, find someone to produce generic toiletry items for kids, maybe an own label producer for supermarkets or a foreign factory looking for some ideas to use up production capacity. Second, find a kids’ brand that’s well-known and will look just right on the label, with all the feel-good associations you need to get kids pestering parents to buy these new products for them. Finally, find a leading chain to stock the items. If no-one volunteers despite the margins you’re offering, give them exclusive distribution (but choose your partner carefully) and then put their logo on the packs. Easier said than done, but I discovered an innovative concept recently that seems to do all of the above. Or does it? Beauty baby is the toiletries company. The kids brand is Bobby Car. Müller is the drugstore chain. I watched kids carefully in front of the products. Many looked twice. Instant recognition. But none picked up the products. This ain’t working. I think this venture fails on the second bit above – the brand and the transfer of that brand into a market which they have nothing to do with. Ok, this is a known brand expanding into new products – on the Ansoff matrix that’s a product development strategy. 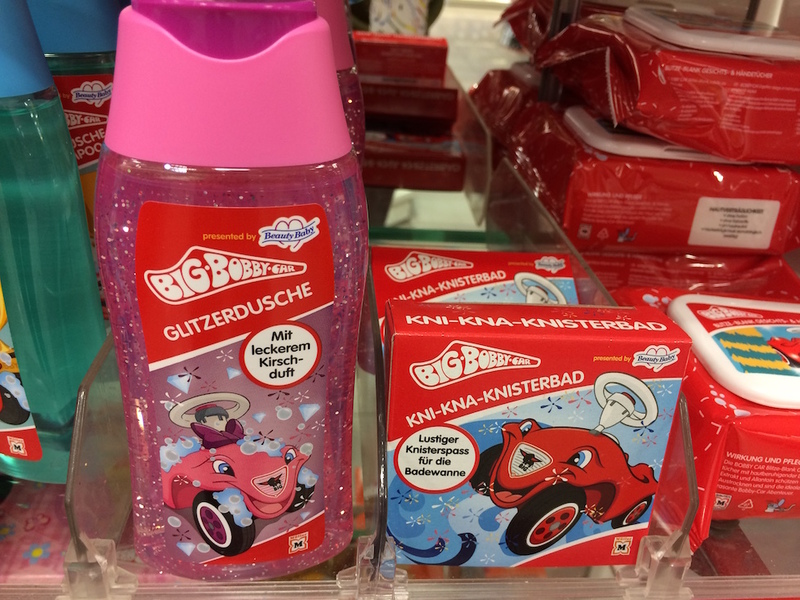 But WHERE – pray tell me – is the link between Germany’s leading kids’ street car brand and toiletries?!? Müller has done some good stuff over the years, and they’ve agreed to stock some products with good designs and appealing pack shapes, but it’s the overall strategy I can’t get my mind round. And I’m amazed Bobby Car agreed to it. I wonder how long Müller will give this venture to prove itself. This entry was posted in Market growth. Bookmark the permalink.